There are plenty of voices on social media, so how do you make yours stand out? Various techniques abound that can sometimes be a hit and sometimes be a miss, such as hosting contests, paying to promote your posts, etc. But one sweatless, free way to maximize your exposure and engagement is to discover the optimal times to post. “Your visitors and followers prefer using social media sites during specific hours. So if you start sharing your content when your users are on these social sites, you’ll not only gain more shares, but you’ll also notice an increase in traffic,” Neil Patel said. Patel is a successful entrepreneur who was dubbed by Forbes Magazine as one of the top 10 online marketers. There are different charts and graphs online that give the generally accepted best times to post on the various social media platforms. Those universal lists and infographics that you can find on the Web are helpful but might still leave you “stabbing in the dark” at what works best for your specific business and audience. How can you figure out the right times to post for your particular audience? Of course, you can run your own scientific experiment. You can post at the various recommended times floating around online (because different sources seem to have different time frames, go figure), and use the “spaghetti method” to see what sticks. But if you are busy selling homes (that’s the point, right? ), especially if you are a solopreneur, you might not have the time to devote to such a task. 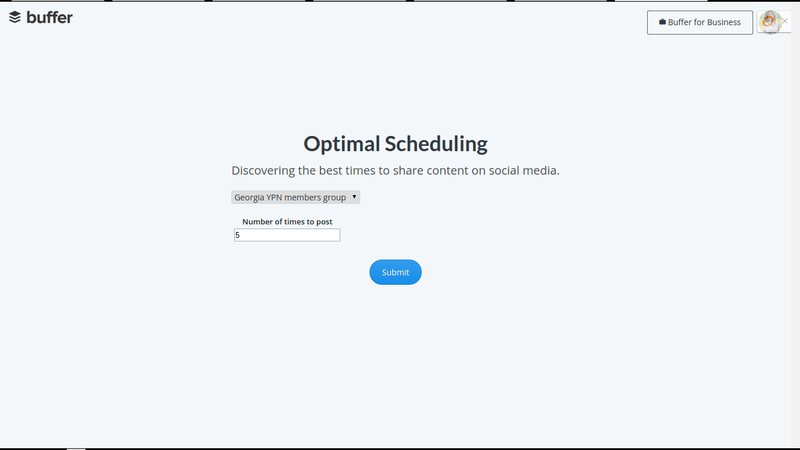 A less time-consuming option is to use Buffer’s Optimal Scheduling Tool. If you use Buffer already to schedule your posts on other social media channels, then this tool will quickly help you determine your best times to post for maximum engagement. If you are not using anything to schedule your social media posts (you are still manually posting whenever you have a “Eureka!” moment), then you might have a sense of nausea strike you when you hear the term “social media” because you have not made automation work for you. If that describes you, I highly encourage you to explore the entire Buffer suite — they have free and paid options. The various tools of Buffer can help you make more efficient use of time so that you can still leverage the exposure and business available on Twitter, Facebook, Google Plus, LinkedIn and Pinterest without neglecting your day-to-day sales duties. To optimize your schedule, Buffer looks at the past 5,000 interactions (likes, favorites, clicks) you have had on the profile, as well as similar profiles in the same time zone. Then they plot these optimized times in a 24-hour period to see when most interactions happened. 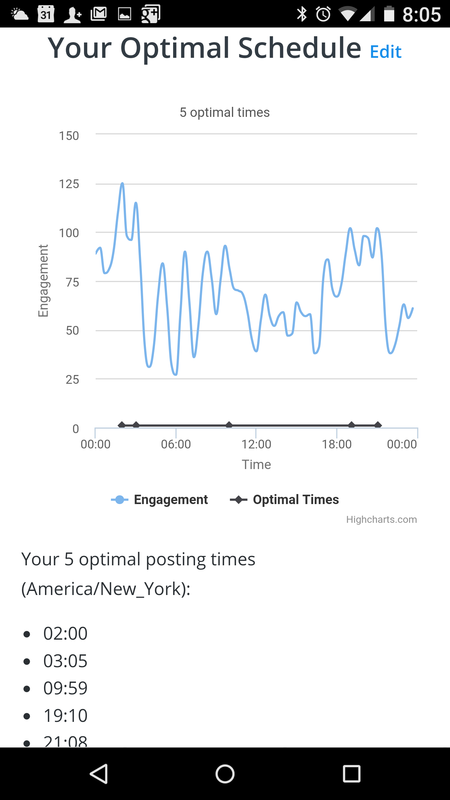 They include an experimental element that chooses time slots outside your top engaged times to find new optimal timing for your posts. Go to the Buffer site, select the social media platform for which you desire to optimize the posting time (you can tailor this to your different social media sites), leave the default number of times to five, so that you can see your top five optimal posting times and click submit. Review the chart and determine if you want to use all or some of the recommended times. Note: Buffer uses a 24-hour clock. 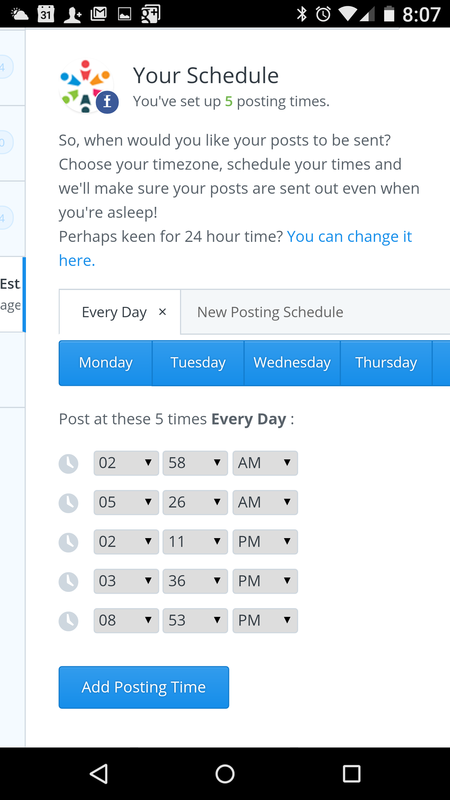 Update your Buffer posting schedule to reflect the new times by clicking the “Replace Existing Schedule” button. On the next screen, you can delete the times that you do not want to try. For example, out of the five recommended times, I know my audience can only handle one or two posts a day, so I removed three of the suggestions. Once you have narrowed down your posting list, click the “Add Posting Time” button. Bada bing bada boom. 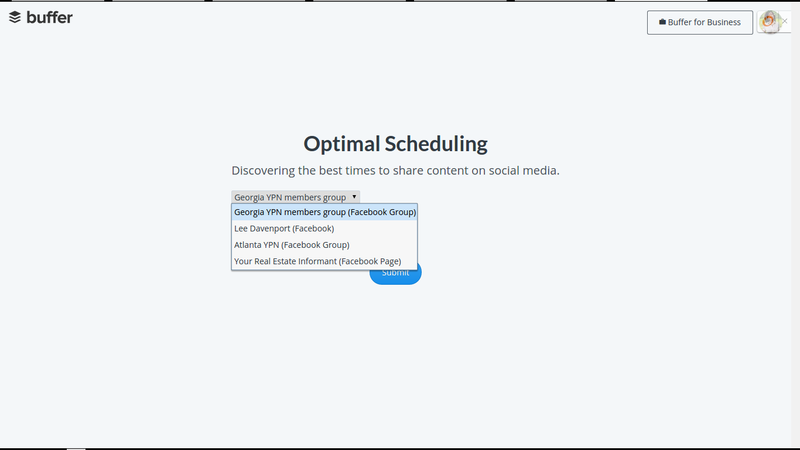 If you have tried the Buffer Optimal Scheduling Tool, share you comments below on how it worked for you — inquiring minds want to know. Lee Davenport is a licensed real estate broker, business doctoral student, trainer and coach. Learn more about the training and 1-on-1 coaching programs that she offers by visiting www.AgentsAroundAtlanta.com. Follow her on Google Plus and Facebook. Is this CRM on your real estate radar?